After a whirlwind couple of weeks with a bunch of international travel, I’ve finally had a chance to sit down and write about my most recent paper on the ankylosaurs of the Baruungoyot and Nemegt formations of Mongolia. I’ve been interested in these ankylosaurs for a long time now, both because of their interesting cranial anatomy and their relationships to the ankylosaurs of North America (especially Alberta). So, here’s a plain-language summary of some complicated taxonomy! Hooray! Part the first: Dyoplosaurus giganteus A toe! 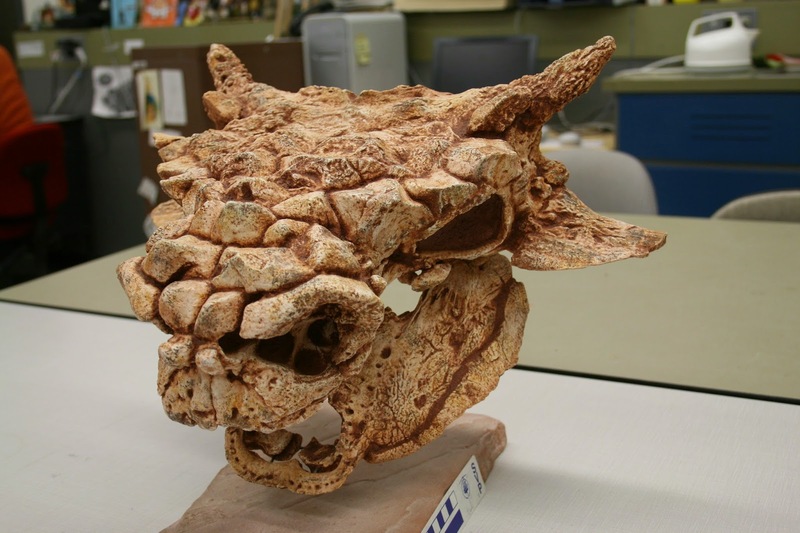 …it was partly synonymized with the newly-named genus Tarchia, based on similarities between the osteoderms, which then included Tarchia gigantea and Tarchia kielanae. Most people picture the beautifully preserved skull in the PIN collections as ‘the’ Tarchia, but in fact it is not the holotype of either D. giganteus or Tarchia kielanae. T. kielanae‘s holotype is a partial skull roof. Later, Tarchia kielanae was considered a junior synonym of Tarchia gigantea because it’s quite fragmentary and there weren’t any obvious differences between the two skulls. But here’s the catch: the holotype skull of Tarchia kielanae does indeed preserve a diagnostic character that is not present in the PIN ‘Tarchia‘ skull – a weird little ossification that sits on/in front of the squamosal horn, but isn’t the squamosal horn. 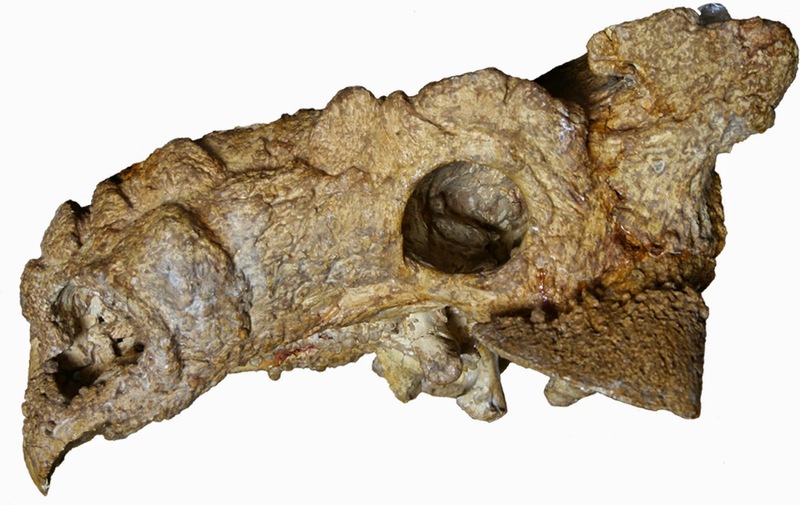 This feature is found only in one other described specimen – the holotype of Minotaurasaurus ramachandrani. On the left, a sketch of T. kielanae’s holotype from Maryanska’s 1977 paper; on the right, a cast of the holotype of Minotaurasaurus. 3. There are no diagnostic features in D. giganteusand no reason to refer the PIN skull to Tarchia, so T. gigantea is redundant. 4. I’m sorry other ankylosaur workers, this really messes things up. The Minotaurasaurus holotype is much more complete than the T. kielanae holotype and provides most of the anatomical information for Tarchia kielanae. Tarchia kielanae has extremely narrow squamosal horns, a prominent prefrontal caputegulum, four internarial caputegulum, a huge mandibular caputegulum, and that distinctive ossification above the squamosal horn. Part the third: What about Saichania? 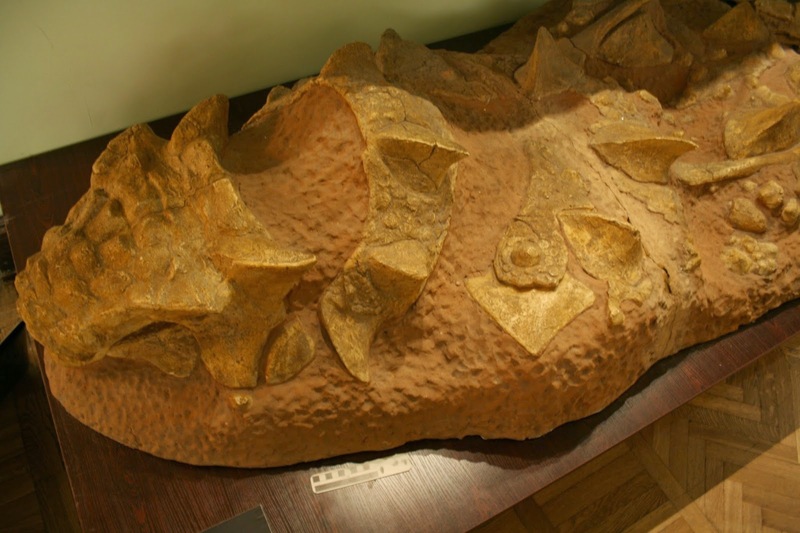 The Museum of Evolution in Warsaw has a cast of Saichania with the elements in situ. Saichania is safe! 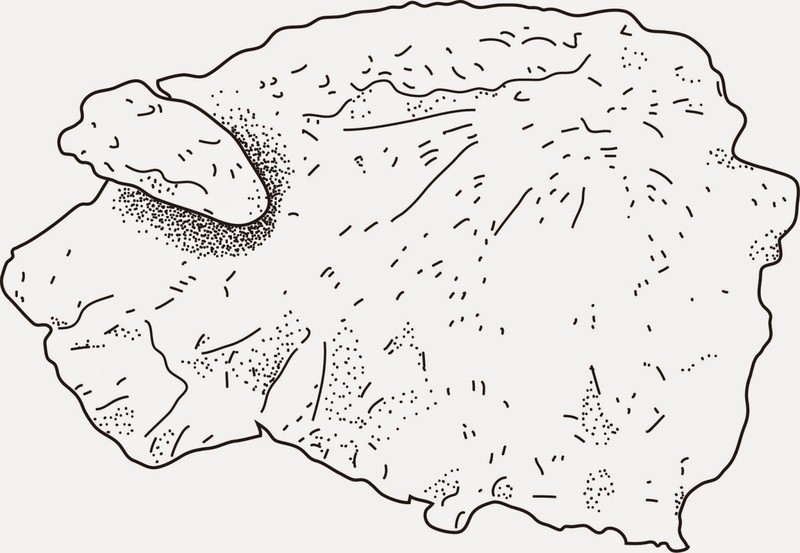 This is an easily diagnosed taxon based on a GREAT holotype which includes a skull and front half of the postcrania and osteoderms that were articulated at the time of discovery (a cast of the in situ specimen shows the original arrangement). But, Saichania is probably not what you think it is – most people (well, at least those who think about such things) will probably visualize the mounted skeleton found in several museums/traveling exhibits. In one of my previous papers I argued that this skeleton should not be referred to Saichania based on several differences of the postcranial anatomy, and its provenance from the Djadokhta Formation rather than the Baruungoyot Formation. (The skull on this mounted skeleton is a cast of the holotype Saichania skull, and so unfortunately there isn’t a lot of overlapping material.) Instead, that skeleton is possibly a relatively mature Pinacosaurus, or something different entirely. Not Saichania, unfortunately! (Except for the head.) But maybe a big Pinacosaurus? What about the PIN ‘Tarchia‘ skull? Although it has a few small differences compared to the holotype Saichania skull, my best assessment right now is that this skull should also be referred to Saichania, not Tarchia. Both skulls have robust squamosal horns compared to the rediagnosed Tarchia, a small prefrontal caputegulum and large loreal caputeglae, and only a single internarial caputegulum. 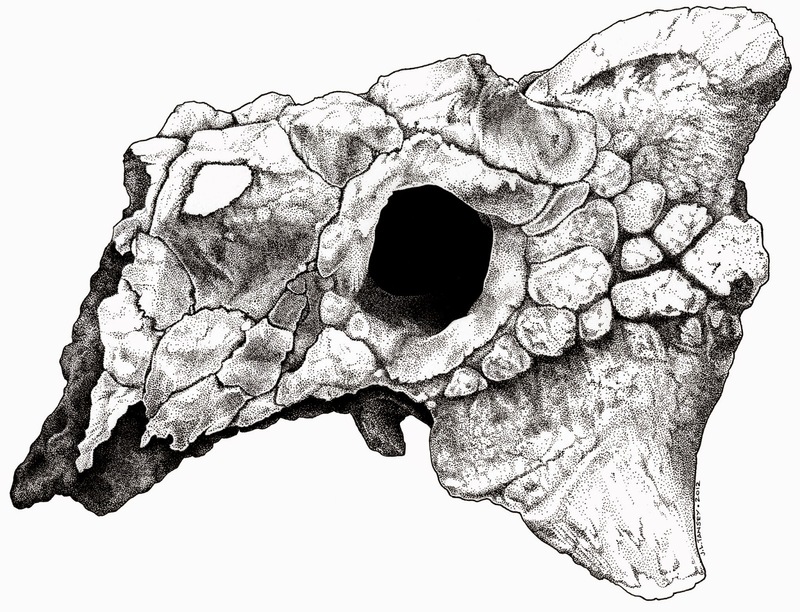 Eventually, as more specimens are found and described, it might be worth creating a new species of Saichania for the PIN skull, especially given that it was found in the Nemegt Formation and the holotype of S. chulsanensisis from the Baruungoyot Formation. Alternately, there might just be a single species of Saichania in both formations – a better understanding of the dinosaur biostratigraphy of Mongolia is much needed! Part the fourth: A new kid on the block! Meet Zaraapelta nomadis, a new ankylosaurid from the Baruungoyot Formation! This specimen was collected during the 2000 Dinosaurs of the Gobi expedition organized by Phil Currie and Nomadic Expeditions. Please enjoy this beautiful life restoration of Zaraapelta by my lovely and talented friend Danielle Dufault! Zaraapelta has some features that indicate it’s relatively closely related to Tarchia, including prominent prefrontal ornamentation. However, it has a couple of unique features that show that it is distinct – the squamosal horns are deep, like in Saichania, and there is extensive ornamentation behind the orbit. The squamosal horn also has a weird double-layered texture that I haven’t encountered in any other ankylosaurid. At the moment we only have a skull for Zaraapelta, but I’m hoping that with the revision of ankylosaurid taxa I’ve proposed in this manuscript, future workers will be able to identify more specimens for these taxa as well! And many thanks to Jessica Tansey, who did the technical illustrations of the skull for me while she was an undergrad at the UofA! A cast of the ZPAL MgD I/113 tail club in the UALVP collections. 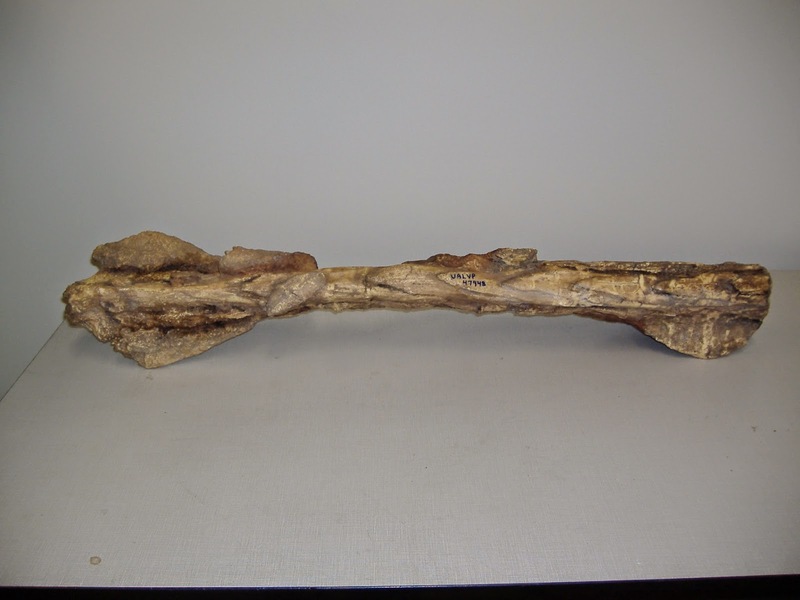 One really neat thing that I’ve mentioned in a couple of previous papers is that one specimen collected by the Polish-Mongolianexpeditions in the 70s has a weird and unique tail club morphology. In pretty much all ankylosaurids, the tail club handle vertebrae look like a nested series of Vs in dorsal view, and the angle formed by the point is about 20-22 degrees. Ankylosaurus is the odd one out because it has distinctive U-shaped vertebrae. And ZPAL MgD I/113 has a morphology that’s in between these two – not quite U-shaped, but not as sharply pointed as the V-shaped morphology in other ankylosaurids. There are also specimens from Mongolia with the V-shaped morphology, so we’ve got at least two species represented by tail club handles. But here’s the problem: although we’ve got some really great skulls, partial skeletons, and skeletons with in situ osteoderms, there actually aren’t any skeletons with both a skull and a tail club from these formations in Mongolia! Do either of the tail club morphotypes belong to the named species from Mongolia? Or does the unusual tail club handle represent a new species in the Nemegt Formation? We’ll only be able to figure this out if we find a skull and tail club in the same specimen, but it would be pretty exciting if we were able to name another new ankylosaur from the Gobi. So, that’s a brief overview of the taxonomic stuff from the new paper. But before we finish, I want to pause for a moment to acknowledge one of my coauthors who couldn’t see the paper in its final published form. 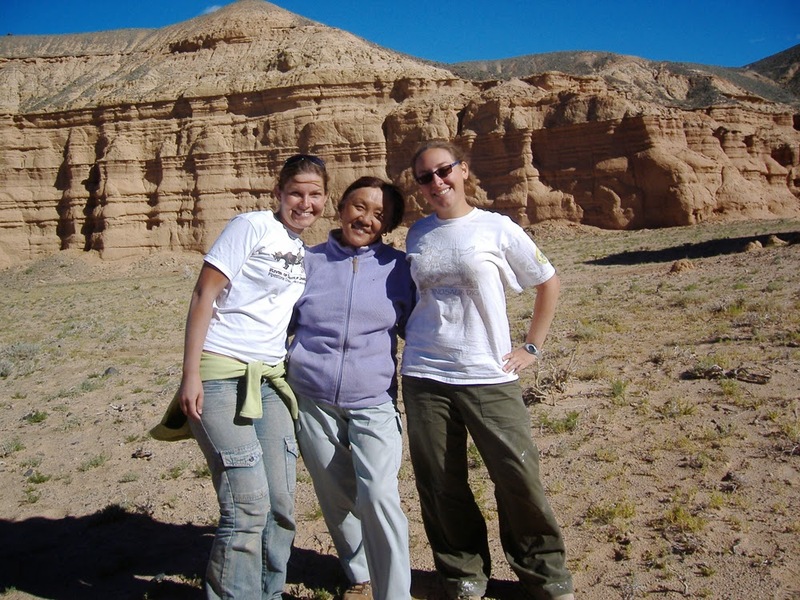 Very sadly, our friend Badam passed away suddenly last December, which came as a shock to those of us who’ve benefited from her kindness and generosity while we’ve visited Mongolia. I wish I had had more time to spend with Badam, but I’m extremely grateful for the times I got to spend with her in Mongolia and when she visited Edmonton a few years ago. She is a presence that will be missed. Miriam, Badam and I at Nemegt in 2007. A happy time. We miss you, Badam. I’m glad to see this paper finally published – it was another one of those multi-year projects to visit lots of museums in order to see all of the necessary specimens – and it was a nice send-off for my time at the University of Alberta. Last weekend I moved down to Raleigh, North Carolina to begin a postdoc with Lindsay Zanno at the North Carolina Museum of Natural Sciences/North Carolina State University. I had an amazing time in Edmonton and I’m sure that’s not the last Alberta will see of me, and I’m hoping to accomplish some fun things here in Raleigh. To new adventures! Arbour VM, Currie PJ, Badamgarav D. 2014. The ankylosaurid dinosaurs of the Upper Cretaceous Baruungoyot and Nemegt formations of Mongolia. Zoological Journal of the Linnean Society 172:631-652. I want to say how pleased I am that you valued the original nomenclature here. So many workers lately seem to just dump fragmentary holotypes and designate more complete neotypes, which is pretty lazy IMO. I wouldn't be surprised if someone else writing your revision just decided to make the Minotaurasaurus type the neotype of Tarchia gigantea out of pure convenience and nomenclatural “stability”. Next we need a revision of Bohlin's ankylosaurs! Sauroplites, Heishansaurus, Stegosaurides, Peishansaurus… This is untouched territory for over six decades. Thanks! 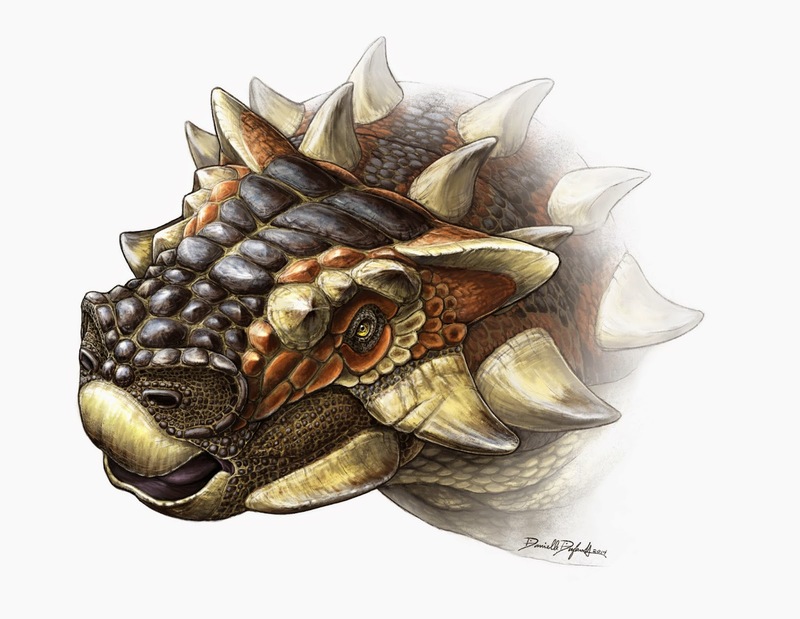 And stay tuned for more info on Bohlin's ankylosaurs – I'm still working on publishing the remaining chapters of my thesis, and I attempted to tackle all ankylosaurids. I didn't realize your PhD thesis was out yet. Found it and read it, and I must say it's excellent. Sad to see how many specimens can't be found in their supposed repositories, which we also saw with Maidment's stegosaur review. Indeed, I never noticed that the repository of Bohlin's specimens is never specified in his paper. He just says “The whole material of fossil vertebrates was returned to China.” Wow, that'll help people track them down in the future. 😐 Has there been any effort to locate them by contacting the Ethnographic Museum in Stockholm? Or are we just depending on Sullivan (2006) saying it is lost? I haven't tried contacting the museum in Stockholm, but that's a good idea! That's an interesting idea, but I think we can exclude the idea that the shape change is ontogenetic. Juvenile Pinacosaurus from Alag Teeg have the V-shaped morphology, as does the large “Syrmosaurus” individual at the PIN. 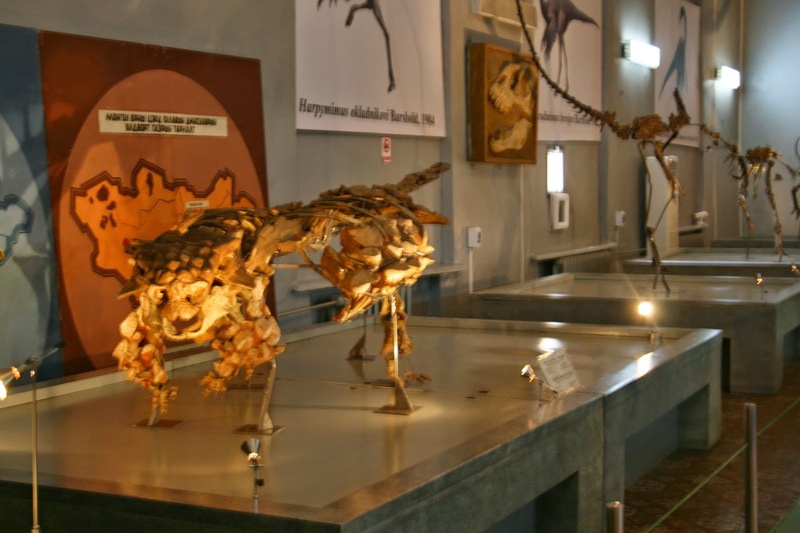 Say I was wondering, if this Saichania display actually has the body of a different animal, are there any other referable postcranial materials that do belong to Saichania besides the in situ specimen? Are there any for Tarchia? Also, I read somewhere that it's been suggested that the Baruungoyot and the Djadokhta Formations are actually upper and lower parts of the same lithological unit without any distinguishing boundary, and I was wondering if that idea still holds any weight. 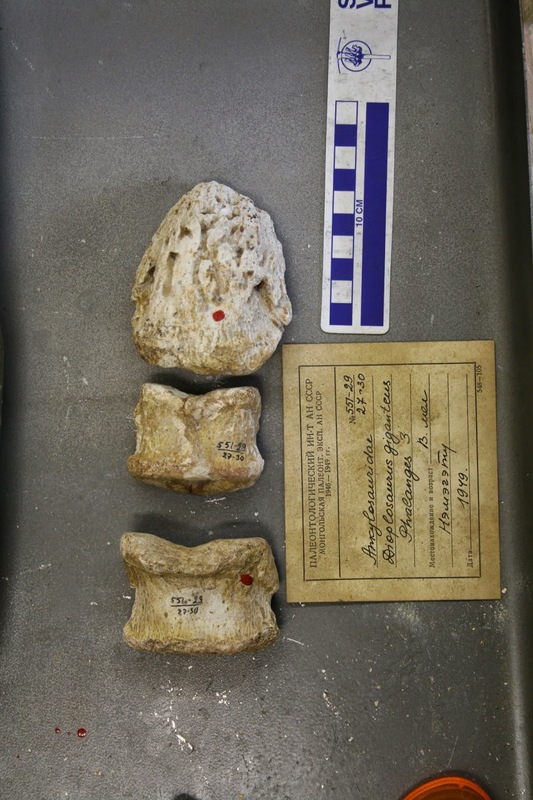 There are some postcranial specimens that can be referred to Saichania, but most of these are unfigured and undescribed specimens at the PIN in Moscow. In particular, PIN 3142/251 has an undescribed skull and a tail club that is on display – this specimen was referred to Saichania by Tumanova and if we can confirm via the skull that it is indeed Saichania (and not referable to an existing or new taxon), that would go a long way towards solving the tail club conundrum. The Korea-Mongolia International Dinosaur Project also collected several excellent ankylosaur specimens that await description. As for the Baruungoyot/Djadokhta/Nemegt stratigraphy, we know that the Baruungoyot and Nemegt formations interfinger, and I also know that there's some active work on refining the stratigraphy of at least the Baruungoyot and Nemegt formations and correlating between different localities. Long before Eberth's paper came out, it was obvious from strat. columns in THE AGE OF DINOSAURS IN RUSSIA AND MONGOLIA that the Nemegt and Barungoyot formations interfinger at Nemegt. HMNS researchers observed the same at Khermeen Tsav. I always felt the latter locality and type locality were at the same level–bottom–whereas other localities like Nogoon Tsav, were representative of the top. Lam Luong, several years ago a researcher back from the Gobi predicted that the boundary between the Djadokhta and Baruungoyot formations won't be found because it doesn't exist. He said they're indivisible.